In fourth grade children’s math skills are taken a step forward through the introduction of math topics like algebra. This area of math has an alpha numeric representation of relations and sometimes students need to unlock the relationship between variables by finding unknowns in an equation. For this grade, algebra4children offers a wide range of free activities. In grade 5, children get more challenged as they need to master applying advanced math skills. Pre-algebra at first looks complex to comprehend but some basic rules could be essential turning points in this topic. On algebr4children, we offer a wide variety of games, worksheets and quizzes which will aid children and educations both at home and in school. Math remains one of the most challenging subjects for primary school kids. It is more so when children get introduced to algebra I and II. Taking kids out of the concept of maths only as dealing with figures to a situation of dealing with both figures and numbers could be a big challenge. By understanding this challenge, we have created tons of free resources for you. Math is fun depending on how it is taught. We have followed up with this idea by striving to create the best teaching materials online. Featuring are math worksheets, games, quizzes and more. These resources cover topics like: exponents, Pythagorean Theorem, roots, standard forms, linear equations, graphs and more. Have fun and please share. 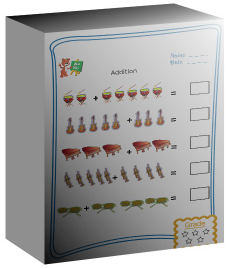 Worksheets on algebra4children are of the best quality both in content and appearance. These worksheets cover a wide range of topics that are covered from kindergarten to 3rd grades. Each sheet is a pdf printable page containing a series of math problems. Children can use them to improve their skills at home, while teachers can use them for extra practice. This section contains free math ebooks which could be downloaded instantly and printed out as a physical product. Each ebook contains loads of math activities as per the theme covered. Parents and teachers can use these to supplement their kid’s regular course. 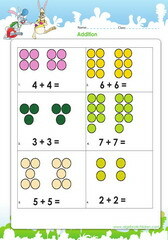 These worksheets could also be printed as a collection in a math workbook for use at school.